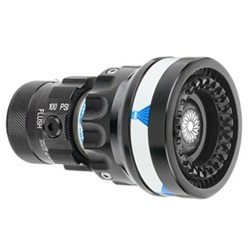 The QuadraCup TFT exclusive is designed specifically for water and foam applications with Class A and AFFF foam in a single nozzle, no attachments necessary. The QuadraCup is ideally suited to work with eductors, on-board foam proportioning systems, or even batch mixed foam solutions and can easily move from aspirated foam to a wide protective fog pattern. The QuadraCup series offers models specifically for break-and-extendoperations, or with an integrated stainless steel ball shutoff and TFT's unique "quick change" rear valve seat as well as color coded handle and pistol grip. 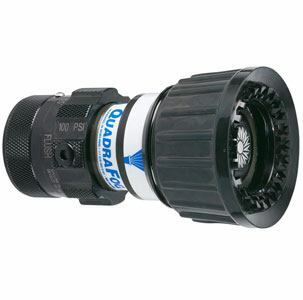 QUADRACUP TIP 1.5" NH (38mm) Selectable gallonage nozzle with four flow settings of 30, 60, 95, and 125 gpm @ 100 psi (110, 230, 360 and 470 l/min @ 7 bar). All lightweight materials, hardcoat anodized aluminum. Flush without shutting down. This tip-only design has an "off" position for break-and-extend operations. 1.5" NH (38mm) rigid thread is standard. QUADRACUP NOZZLE 1.5" NH (38mm) Selectable gallonage nozzle with four flow settings of 30, 60, 95, and 125 gpm @ 100 psi (110, 230, 360 and 470 l/min @ 7 bar). All lightweight materials, hardcoat anodized aluminum. Flush without shutting down. Quick-change rear valve seat and stainless steel shut-off ball. Rocker lug 1.5" NH (38mm) swivel is standard. 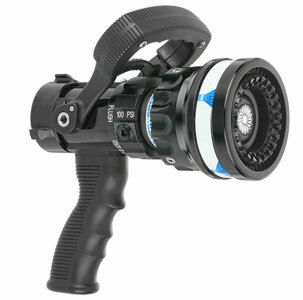 QUADRACUP W/GRIP 1.5" NH (38mm) Selectable gallonage nozzle with four flow settings of 30, 60, 95, and 125 gpm @ 100 psi (110, 230, 360 and 470 l/min @ 7 bar). All lightweight materials, hardcoat anodized aluminum. Flush without shutting down. Quick-change rear valve seat and stainless steel shut-off ball. Pistol grip is mounted below the valve. 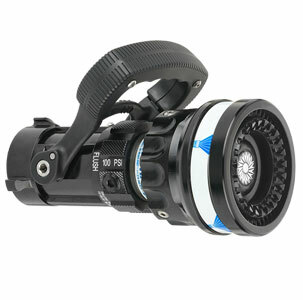 Rocker lug 1.5" NH (38mm) swivel is standard.